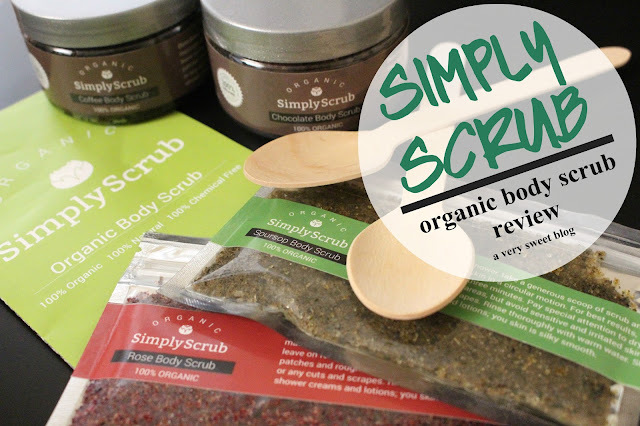 Press Sample - I was asked if I would like to try some ORGANIC body scrubs from a company called Simply Scrub. Before accepting, I checked their website and their body scrubs are 100% natural, 100% organic and 100% chemical free. Impressive! Because as you know, nowadays some companies say their product is organic, but it's not 100% organic. I also liked the fact that I could pronounce (and understand) the ingredient list on the back of their products. So what are my thoughts? Read below. This was my favorite! Do you like coffee or the aroma? I'm not a big coffee drinker, but I love the aroma of freshly brewed coffee. Expect your shower to smell just like a coffee house :) It smells like freshly ground coffee beans. It's invigorating! These grounds are DRY! Take a scoop. Rub them on your skin. Let them sit for 3-5 minutes! Then rinse away. The grounds are very coarse, but surprisingly they didn't irritate my dry/sensitive skin. I never turned red or experienced any type of irritation/reaction. After rinsing, my skin felt moisturized! Not oily. Not greasy. Just soft & moisturized. Oooh Chocolate! This Chocolate Body Scrub smells like German Chocolate Cake! It has a stronger coconut mixed with chocolate than chocolate scent (to me). The scrub is DRY. Apply it to wet skin and have moisturized skin afterwards. Soursop? What's Soursop? LOL It's a spiky green fruit that's grown in South America, Africa and Southeast Asia. This scrub has a soft spring garden outdoorsy scent! It's to help with eczema, rheumatism and other skin conditions. And for anyone that loves roses, there is a rose body scrub. It smells authentically like a bouquet of roses! Rose has anti bacterial properties to keep skin clear and pores tight. I'm not an outdoorsy girl, so these scents didn't appeal to me (personally) but they did work effectively and would be great for someone that does! Would you like to try Simply Scrub (Continental US)? They're currently giving free samples (2 samples per customer) on their website. Also look for the pop-up, that comes on their website that offers 10% off + Free Shipping on your order when you enter your email address. I think both are very nice offers. It's a great way to try their products and see if they're right for you. Oh I would love to try the chocolate one Kim! It looks good enough to eat, haha! These scrubs sound amazing and they are organic that is a big plus for me. I'm glad you check out their website before accepting I do the same with anyone who want to collaborate I reject any if they are not legit. These scrubs sound and look like fun and organic too!! Thanks for the review. Ahh that coffee scrub sounds great and I've been after one for AGES! Coffee is so invigorating and so I can imagine how nice it'd be as a scrub. This brand sounds really good. As an obsessed coffee drinker, that first scrub is right up my alley, Kim! They all sound lovely though:) Thanks for the review. I love coffee scrubs. Great for invigorating your body! This brand sounds wonderful, Kim, thanks for introducing me to them! I too look thoroughly at the ingredients when a product or brand claims to be organic. It's permissible for a brand to slap organic on their labels, even if it's only 1%, which is crazy! My husband and I drink coffee on a regular basis (we brew our own at home) and I've recently been using the grinds leftover mixed with olive oil in the shower and results are just as you said, moisturizing! My skin is silky smooth all over, which was never the norm for me. Out of the products you've listed, I'm curious about both the chocolate scrub and the rose and soursop scrubs. It's amazing how these all natural ingredients are inspired and derived from Caribbean countries, as well as Africa. It's now wonder that many of the people who live there look fantastic well into there 70s and 80s; they've been using these natural remedies for years! It's always better to use all natural and organic, I believe our bodies react to them better chemistry wise. This sounds so luxe… and I have a soursop tree ! Its a big green spiky fruit that's actually really good - and its said to fight cancer. If you were to buy it in the supermarket - they are hardly available -you'd pay at least 10USD for a small one. These all sound amazing Kim! I would love to try these, especially the coffee one!! I love how they are truly orangic and natural too!! so nice that you got to try these out! Wow, these products sound really amazing! I love how coffee scrubs smell, but you totally sold me on this when you said it smelled like German chocolate cake! Yes, please! hi dear, i love coffee scrubs.. It's definitely impressive that these scrubs live up to their claim of being 100% natural and organic. I don't drink coffee but I do like the smell of it and the chocolate one sounds amazing as well. I am a huge fan of body scrubs and these def sound impressive! The coffee scrub piques my interest, I don't think I have tried this scent as a scrub, but I'm most certain that I would love it as I adore the aroma of coffee. I would love to try these scrubs!! organic is the way to go ! great review Kim! The organic scrub sounds just right for me, and the free samples even better. I like that you said it was good for sensitive skin, because that's me. i was surprised to see that some burt's bees products aren't 100% organic. skipped buying their facial scrub and went with Alba yesterday! It's always nice when you can read the ingredient list. I am a sucker for beautiful packaging. And this one looks good. I lvoe body scrubs!! Especially during hte winter when my skin really needs to be exfoliated! that coffee body scrub sounds so cool! I would love to try it. although i do love coffee i dont necessarily like the smell of the grounds as a body lotion or scrub, but sounds interesting! how cool that they also have chocolate and other flavors! lol sounds like a great line of products! hope you have a wonderful day Kim! These sounds great Kim, and definitely a great thing that the company actually has real "organic" ingredients that you can pronounce. I like coffee using scrubs, so I am drawn to that one firstly. Happy Wednesday. Oooo! Perfect timing, Kim because my coffee scrub by Jealous Body Scrub is about to finish and I'm looking for a new all natural body scrub to try. I'm going to check out this site and hopefully they have shipping to Canada. I don't think I could do the chocolate scrub because (this might sound weird) I don't like chocolate, lol, but the coffee scrub looks awesome! I'd love the chocolate one! I am also not a coffee drinker but it seems like a good body scrub products with coffee scent so I am quite interested to try out something like this (: x amazing review. Really amazing products! Thankf for the useful review!! These sound amazing! I do love a good scrub! There are so many organic products now. These look natural and wonderful to use for the body. These scrubs are a novelty for me for the ingredients, especially the coffee and soursop call my attention. i'd love the smell of chocolate AND coffee, lol!!! i'm gonna check on those samples! Loving it! The smell must be amazing! I don't think I have tried any organic products before actually...but I like the sound of this one. What an interesting combinations of scents and texture! I'm always eager to discover new organic products, thanks for the review! Merry Christmas, Kim! Great post, I've been really interested in trying out a coffee scrub. i can only imagine how soft your body will feel after scrubbing! does it smell like coffee?